VIDEO: Who Polices The Police? The film is a blow-by-blow account of their journey as they question the police officers accounts, visit the crime scene, speak to witnesses, examine evidence. Harrowing footage emerges that show the last moments of Sean’s life. The family watch in horror. The conclusion they come to – Sean died at the hands of the police. ‘Who Polices The Police?’ builds fragments of reality, of memory and of resistance into a powerful document about a struggle for justice. You can see the full film on Vimeo by clicking HERE. Migrant Media was established in 1989 and is a collective of radical film makers working in documentary production. It is a collective of media producers and activists embedded with communities of social and political interest. Migrant Media’s work has a focus on race and class with a central narrative of resistance. 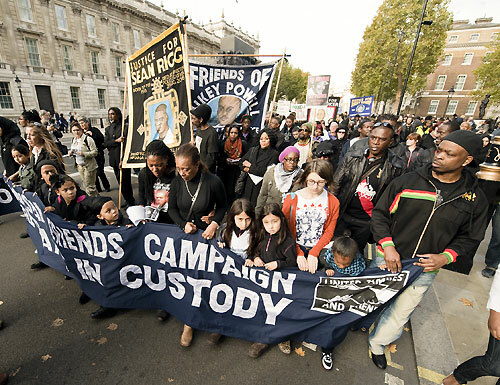 Damning report on the Sean Rigg IPCC investigation – a watershed moment in fight against custody deaths?